Living in the Northwest we are especially fascinated with a studio that is located in our own area. We had never heard of this company when we received this book. It was fun learning about this contemporary pottery studio and its artists. 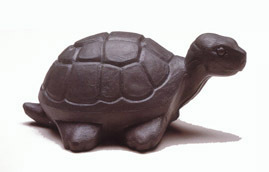 Ray Markow, upon graduation from University of California at Santa Barbara in1973, set out to establish his own pottery studio. A friend’s garage was rented and he set about developing colors, glazes and new shapes. He gave his studio in Santa Barbara the name of Ray’s Pottery. Within five years he hired three decorators and two potters. Production grew and they soon needed more space. 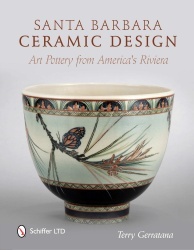 In August 1976 Ray moved his studio into a 4000 square foot building and he renamed it Santa Barbara Ceramic Design. Ray was constantly looking for new ideas. Stenciling of designs in the clay along with vibrant colors caused a lot of attention when the wares were being sold at street craft fairs. By the end of 1977, the studio had amassed over $48,000 in sales. Seven more pottery artists were hired from 1977 and 1978. The studio was expanding and so were their sales. The book shows off their many styles of beautiful pottery types. Some of the techniques they used involved sgraffito, majolica, wax designs, airbrushing, and stenciling. In 1978 the artists began signing their work. The creativity of all the artists enabled the studio to expand and enhance their designs. Influences from previous operating potteries of Rookwood, Roseville and Weller are very evident in in this pottery. Earth tones and realistic colors set the pottery apart from other pieces in the area. The book is divided into 11 chapters and shows the progression of the studio development. The first chapter defines its early beginnings with the following one showing its first growth spurt. The next three chapters show the changes made from 1980 to 1987. The studio contracted with several independent artists like Mary Engelbreit to produce lines for the company in 1987. Chapter 6 lists the many decorators that worked at the studio and the type of items they made. Company Culture is explored in Chapter 7. Historical information is given about their activities, details of the artists, how time was spent socializing and shows attended. 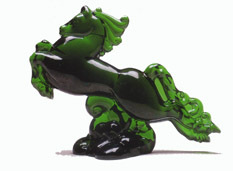 Special shapes, designs and glazes are explored in Chapter 8 called Special. Potteries Contemporaneous with Santa Barbara Ceramic Design are evaluated in Chapter 9. In Chapter 10 a full listing of studio marks are listed with the artist’s name. Company documents are pictured in Chapter 11 along with ordering information. The book concludes with endnotes, a bibliography and an index. This 8 ½” x 11” hardback book has a dust jacket. There are 256 pages with 400 absolutely wonderful color photos of this gorgeous pottery. Artists are pictured throughout the book with their pieces. This book provides lots of detail about this pottery. If you are interested in pottery we encourage you to purchase the book that retails for $39.99.